SNES Demon's Crest (USA) "100%" in 35:04.68 by Brookman. Demon's Crest is the third installment of the Gargoyle's Quest series. 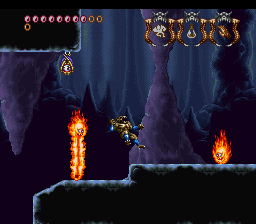 The player controls Firebrand, who is scouring the Demon Realm for elemental Crests, which preside over different elements (Fire, Earth, Air, Water, Time, and Heaven). When collected, these crests allow Firebrand to transform his shape at will and gain powerful new abilities and defenses. Demon's Crest is notorious for some very difficult bosses. In this run, the author abuses boss weaknesses to the extreme by carefully switching Gargoyle forms as necessary. In addition, heavy luck manipulation was used during several encounters to make the otherwise troublesome boss fights look easier than a play through of Barney's Hide and Seek. Brookman improves the previous run by over a minute thanks to greater optimization, different usage of powers, and some route changes. Unlike the previous run, Brookman stops in a shop at one point to get some time-saving powerups. For more details, read the detailed submission comments.